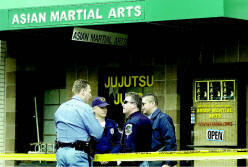 At the scene: Police investigate the shootings of two men found dead Thursday at the Institute of Traditional Asian Martial Arts on Grand River Avenue in East Lansing. Jeffrey Friedlis, 29, of Grand Ledge and Christopher James Emmerth, 32, of Lansing were found shot to death Thursday in the Institute of Traditional Asian Martial Arts in East Lansing. Police are investigating the deaths. Found dead: Jeffrey Friedlis, 29, of Grand Ledge, pictured with wife Lori, was found dead Thursday at the East Lansing martial arts school where he was an instructor. His mother said the couple have been married for seven years and are expecting their first child. Christopher James Emmerth, 32, of Lansing also was found dead at the school, located near MSU. EAST LANSING - Police are trying to figure out how a judo instructor and another man ended up shot to death Thursday on the floor of a downtown dojo. Jeffrey Friedlis, 29, of Grand Ledge and Christopher James Emmerth, 32, of Lansing were discovered just before noon at the Institute of Traditional Asian Martial Arts on Grand River Avenue, police Capt. Juli Liebler said. Two martial arts students headed to class found the men as people shopped and ate lunch just feet away from the studio, located across from Michigan State University. Police said they weren't sure what happened, but they know at least one of the men was shot more than once. 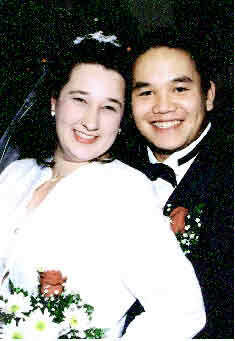 The shootings were not a random act and it appeared Friedlis and Emmerth knew each other, authorities said. The shootings come less than two weeks after the city's first homicide since 2000. Friedlis, a training director at the institute, had been passionate about martial arts since he was 13 years old, said his mother, Judy Friedlis of East Lansing. He leaves behind his pregnant wife of seven years, Lori, Judy Friedlis said. "They're expecting their first baby any minute," she said. Jeffrey Friedlis was adopted from Vietnam when he was 6 months old - a very sick baby but one who fought his way back to good health, Judy Friedlis said. "He was one of those pull-yourself-up-by-your-bootstraps kind of people," she said. While investigators worked into the night Thursday, Police Chief Louis Muhn reassured residents the shooting was not the start of a crime trend but rather an isolated incident. "We're concerned anytime someone is killed, but if you look at our numbers for the past 10 years, you can count on one hand the homicides we've had," he said. Before last month's fatal shooting at the 7-Eleven across the street from the dojo, East Lansing had had one homicide since 1994. Investigators began to sort through the crime scene Thursday afternoon after obtaining a search warrant from Ingham County prosecutors, Liebler said. She didn't know if a weapon had been recovered or if shell casings were found on the studio floor. There was no sign of forced entry. Haslett residents Rob Fulk, 36, and Brian Winn, 32, were eating lunch about noon with a group at Sushi Ya, two doors from the studio, when they saw police officers running down the street. "They said there were gunshots, but we didn't hear anything," Fulk said. Todd Sterbik lives above Gibson's Book Store, next door to the dojo. "I heard a couple sounds this morning, around 11:30 a.m.," he said, but added that's nothing unusual for that time of day. Liebler said police don't know when the shooting happened but talked to one person who was near the studio and heard a "backfiring" sound shortly before the call came in.